Your university education is one of the most significant decisions and investments you will make in your lifetime. In order to help you to make the right decision about where you will spend the next four years, we encourage you and your family to visit Carnegie Mellon University in Qatar located in Education City. The Office of Admission is open Sunday through Thursday from 8:30 a.m. to 5:00 p.m. If you are coming from outside of Qatar, we encourage you to make an appointment with an admission counselor in advance of your visit. Simply call +974 4454 8500 and we will be happy to assist you. You may also email the Office of Admission at ug-admission@qatar.cmu.edu. 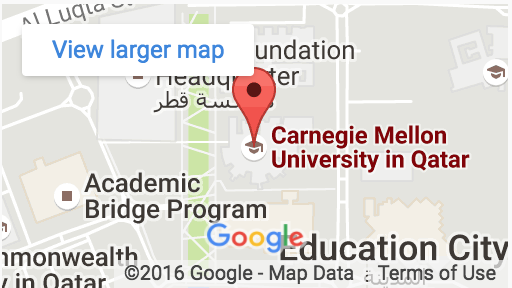 Carnegie Mellon Qatar’s campus is located within Education City (map of Education City in English or Arabic). Located on the western edge of Doha, Education City’s landscaped campus covers an area of 1,500 hectares (15,000,000 sq. m). The site houses the majority of Qatar Foundation’s universities and member institutions in state-of-the-art buildings designed by some of the world’s greatest architects.